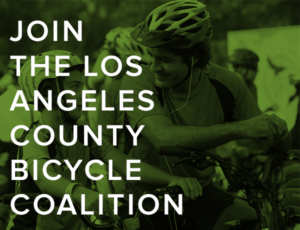 The 4th Annual BikinginLA Holiday Fund Drive! Lots of news to catch up on while I take a break from work. First up, Marco Antonio Valencia has finally been sentenced in the drunken and high hit-and-run death of Joseph Novotny over two years ago. Valencia had an estimated BAC of .23— nearly three times the legal limit — as well as methamphetamine, cocaine and marijuana in his system at the time of the 11 am collision. The now 22-year old driver will spend the next 26 years to life in state prison. Unlike some other notable cases, there’s no satisfaction or sense of victory in this case. At least, not for me. Just an overwhelming sense of sadness that two lives ended that day — Novotny and the man who killed him — because we as a society couldn’t manage to keep a repeat, underage drunk driver off the roads. And fear of how many more Valencia’s there are out there just waiting to happen. Next up, there’s BOLO alert in the hit-and-run death of Alex Romero on the Valley’s Canoga Park Blvd last April. Anyone with information about the crime is asked to call Valley Traffic Detective Krajchir, at (818) 644-8034. During non-business hours or on weekends, calls should be directed to 1-877-LAPD-24-7. Anyone wishing to remain anonymous should call Crime Stoppers at 1-800-222-TIPS (800-222-8477). Tipsters may also contact Crime Stoppers by texting the word “TIPLA” and the message to phone number 274637 (C-R-I-M-E-S on most keypads) with a cell phone. Tipsters may also go to www.lacrimestoppers.org, click on “Submit a Tip” and follow the prompts. An arrest has been made in the case discussed here recently in which a driver was accused of threatening cyclists on Angeles Crest Highway. 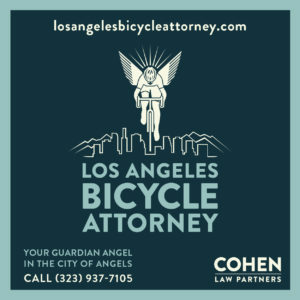 According to the Arcadia Patch, Earl Clyde Cox of La Crescenta threatened two separate groups of cyclists along the highway in a road rage incident. Frighteningly, he reportedly told deputies that the riders weren’t being considerate, so he appointed himself as a driveway vigilante fashion and set out to teach them some manners. I have a feeling he’s going to learn some the hard way himself. There’s good news from Sacramento for a change, as the proposed three-foot passing law passed the state Assembly’s Transportation Committee. According to the California Bicycle Coalition, the measure passed on an 8 to 5 vote after an hour of impassioned testimony, including support from Bakersfield Senator Michael Rubio, who spoke as a private citizen and cyclist. Not surprisingly, the AAA — both NorCal and SoCal editions — came out strongly against the bill, suggesting that it be made optional for drivers. So basically, they think their members should have the right to buzz you if the mood strikes. Meanwhile, a lobbyist for the Teamsters insisted on their members’ right to continue killing cyclists by passing too closely. Now the bill moves on to the full Assembly, which means it’s time to flood your own representative with letters of support for SB 910. On second thought, let’s end on this from Cyclelicious, as he urges you to support another bill, SB 582, that could begin to level the playing field for those who prefer to commute via something other than four wheels. Like a bicycle, for instance. 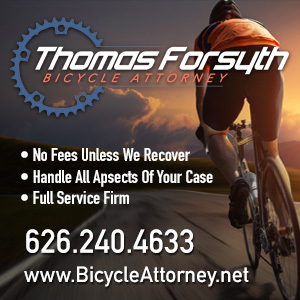 There’s been a non-development in Dr. Christopher Thompson’s appeal of his conviction in the Mandeville Canyon Brake Check, in which the Good Doctor tested his stopping power by slamming on the brakes in front of two riders, seriously injuring both. According to cyclist/attorney Dj Wheels, the oral arguments scheduled for Wednesday have been cancelled after Thompson’s attorney declined to argue his case. Evidently, that’s not unusual. And since the appellant chose not to appear, the attorney for the People of California chose not to appear, as well. After all, there’s no point in responding when there’s no one to respond to. In the normal course, the case will be “submitted” tomorrow (Wednesday), without oral argument, and the court will have 90 days from that date to file its opinion. If the conviction is affirmed, appellant will have the opportunity to seek rehearing, if he can identify a very specific error in facts in the Court of Appeal. He can also, and universally will, file a petition for review in the California Supreme Court, identifying specific issues under specific conditions that would justify a grant of review in the Cal. Supreme court. He may also collaterally attack the conviction in the California courts by means of a writ of habeas corpus. For those federal claims that have been exhausted in state court, he may then file a petition for writ of habeas corpus in the federal district court, which could lead to the 9th Circuit Court of Appeals and the US Supreme Court. In other words, we’ve got a long damn row to hoe before the case involving this particular repellant appellant is finally settled. Jury selection is scheduled for Wednesday in the case of Gordon Catlett Wray, the driver accused of killing local scientist and cyclist Doug Caldwell and injuring fellow rider Scott Evans; opening arguments will follow either Wednesday afternoon or Thursday morning, depending on what time jury selection concludes. The trial will take place at the San Fernando Courthouse, 900 Third Street in the city of San Fernando, case #0SR05313. 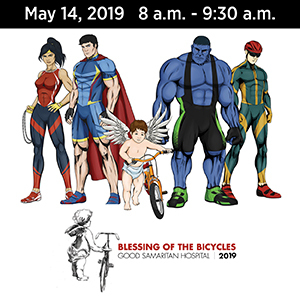 Cyclists are urged to attend to show their support for the victims. Update: I’ve just been informed that the charge against Wray is misdemeanor vehicular homicide; as always, that could be reduced if there’s a settlement. Thanks to John Stesney for the reminder. Outrage from cyclists has had an effect in Mississippi, as a local DA has agreed to reopen the investigation into the hit-and-run driver who ran over a cyclist, got out of her car to look at her, then got back in and ran over her again. The victim was victimized yet again when authorities concluded that her actions weren’t prohibited under Mississippi and there was nothing they could charge her with. Hopefully, a more thorough scouring of state laws will turn up something this time. Personally, I vote for attempted murder. Or at the very least, a couple counts of assault with a deadly weapon. Finally, thanks to George Wolfberg, and Tim Rutt of Altadenablog, for forwarding the New York Times report on noseless saddles designed to help put a little less pressure on the groins of male riders, and help them get a little more wood out of the saddle. Not that you have a problem with that, of course.